Have blankets, draperies and out-of-season clothing cleaned, then pack them right on the hanger in a wardrobe box. Don't overpack boxes. Overfilled boxes will rupture and topple when stacked. A climate controlled storage room is ideal if you are storing heat-sensitive goods such as videotapes, albums, photographs and precious wood furniture. If you're storing tables and other furniture, remove legs and disassemble to conserve storage space. Wardrobe boxes let you move clothes directly from the closet without taking them off the hangers, saving you the cost and time of ironing and dry cleaning but there's room on the bottom of the box for shoes, throw pillows and linens. Pack items you know you'll need (sheets, towels, toiletries, tissues and a change of clothes) in your clothes hamper on moving day and you'll know just where to find them at your new place! Wrap lamp shades separately with clean, non-printed packing paper. Put two or three in a large box. They'll stay clean and won't get crushed. Load houseplants last and unload them first. Load the heaviest items first, in front, and on the floor. Pack items firmly and closely. For clothing or other items in drawers, leave them in the dresser drawers. Just make sure the contents aren't too heavy - too much weight can damage the drawers. Anything fragile should be wrapped in paper first. When packing your smaller framed art or photos separately, choose a box that's larger when it's open on both ends than what you're packing. Open the bottom of the box, flatten it out and seal one of the open sides with tape. Slide the wrapped picture into the unsealed side, then seal it and label the package. Larger pictures, framed art and mirrors should be packed individually in boxes. Use bubble pack around delicate wood frames. After you slide the item into the mirror box, stuff wadded up wrapping paper into any extra space around the item. Seal the box with tape and label it glass or fragile. 1. Group items of similar size and weight. Try not to mix belongings from different rooms of your home. First, pour a layer of packing peanuts into the bottom of the box. Wrap heaviest items first with bubble wrap or packing paper and place them in the bottom of the box. 3. Before closing your box, cushion the entire package using packing peanuts or crumpled packing paper stuffed firmly into unfilled spaces to prevent shifting and damage to your goods. Your filled box should not weigh more than about 30 pounds, or that which you can lift easily. Underpacked boxes may collapse in transit, while overpacked boxes can rupture, damaging belongings. Includes 4 compact and stackable boxes ideal for shirts, blouses, sport coats and jackets. 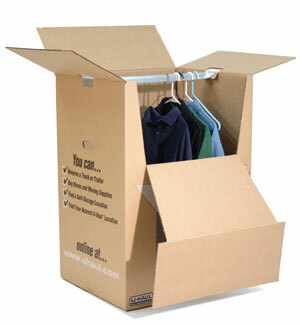 Directly from closet to box, clothing can stay on hangers. Meets UPS shipping requirements.